Ash from the eruption of Eyjafjallajökull Volcano stranded thousands of airline passengers for days, costing the European airline industry an estimated 3.3 billion dollars. Better measurements of the location, size, and thickness of volcanic ash may help minimize the disruption of air travel during future eruptions. If they knew the height of an ash cloud over a widespread area—information only possible from satellite views—forecasters would be able to better predict its movement. 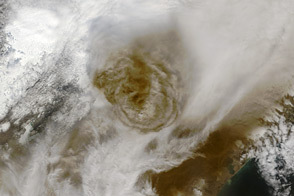 This satellite image shows the height of Eyjafjallajökull’s ash plume, superimposed with a natural-color view, on April 19, 2010. Color corresponds to height: bright blue indicates low elevation ash, green and yellow indicates ash at an elevation of about 3,000 meters (10,000 feet), and red indicates ash at or above 4,000 meters (13,000 feet). 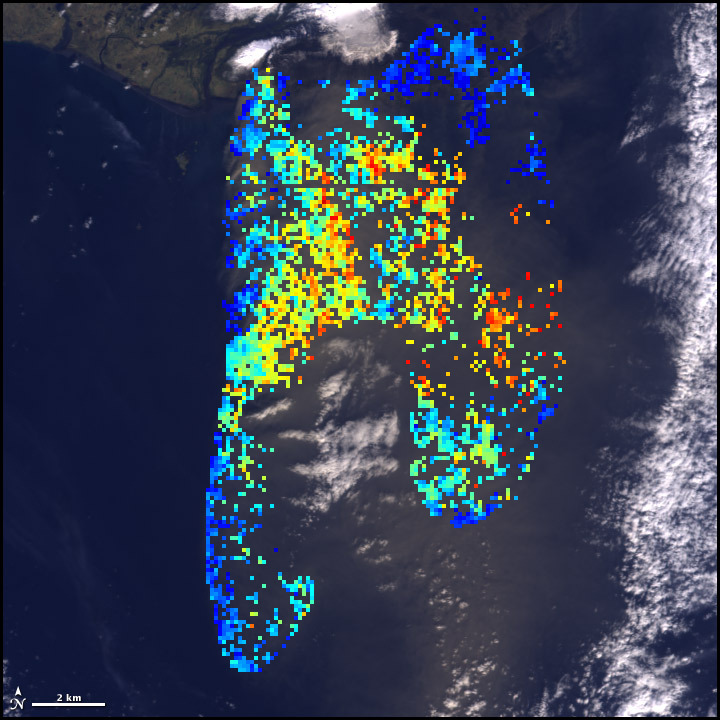 The image was acquired by the Multi-angle Imaging SpectroRadiometer (MISR) aboard NASA’s Terra spacecraft. NASA image courtesy GSFC/LaRC/JPL, MISR Team. Caption by Robert Simmon. Color codes reveal ash layers at different altitudes during eruptions at Eyjafjallajökull Volcano on April 19, 2010. Iceland’s Eyjafjallajökull Volcano burst into life on March 20, 2010. By the last week of May, it appeared to have quieted down. NASA Jet Propulsion Laboratory. (2010, April 20). Heights of the Eyjafjallajökull Eruption Plume - April 19, 2010. Accessed April 28, 2010. Voice of America. (2010, April 27). EU Plans Relief for Airline Industry Grounded by Volcano. Accessed April 28, 2010.